Looking for a fun, exciting place to volunteer? Want to share your passion and enthusiasm for marine biology with others? 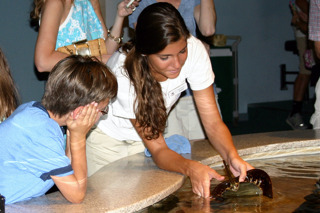 High school students ages 14-17 are encouraged to apply for the Teen Volunteer program at the NC Aquarium at Fort Fisher. Teen Volunteers train with Aquarium staff to learn about our unique animals and exhibits. After training, students educate visitors from all over the world at our two touch pools, bald eagle exhibit and loggerhead sea turtle exhibit. Students wishing to complete their senior project at the Aquarium and be assigned a mentor must be a current volunteer, or must apply and be accepted to volunteer in our teen volunteer program. Students involved in the year-round program are expected to volunteer 8 hours/month for 6 consecutive months, yet have the flexibility of creating their own schedule. This program is recommended for those with busy school, work or sports schedules, out-of-town students, and local students seeking year-round volunteer opportunities. Students involved in the summer program commit to 8 hours/week from June 16 to August 10. Volunteers have a consistent schedule, set by Aquarium staff, of two weekly shifts. The summer program is recommended for local students seeking summer volunteer opportunities. Apply by April 25! Training for the 2019 Summer Program will take place on Saturdays, May 11 and 18. For questions regarding the Teen Volunteer programs, please email [email protected] or call (910) 772-0533. Help support exciting new exhibits, fun educational experiences and vital conservation programs helping to save animals from extinction by joining the North Carolina Aquariums. Members receive a host of valuable benefits like free admission, but also take pride in supporting the Aquariums and their mission. Open 9 a.m. to 5 p.m. daily. Make connections with the natural world. Touch a stingray. Wonder at baby sea turtles. Talk to a diver swimming with eels and sharks. Explore more, together. See why visitors vote the Aquarium a top regional and national attraction each year.